Ash and co. are sailing on Lapras again. Ash only needs one more badge to get into the Orange League. They see a boat coming their way. Misty thinks that the boat will hit them, but instead the boat goes to the side of them. A guy comes out of the boat snickering. Misty doesn't think that it's funny, and she tells the guy to apologize to Togepi. The guy thinks that her anger makes her look like a Tentacruel. Misty takes that as a compliment. The guy notices Ash right away. He introduces himself as Tad. Tad is trying to get into the Orange League too. Tad says that he battled the Trovita gym leader right after Ash. He likes to battle strong opponents. Tad challenges Ash to a battle, and Ash accepts his challenge. They decide to battle on the nearby island. Team Rocket is on the island. They see Ash and co. coming along. Tad tells Ash that they will have a 2-on-2 battle. Tracey wonders which Pokémon Tad is going to use. Ash chooses Pikachu for his first Pokémon. Tad sends out Poliwrath. The strange thing is that this Poliwrath has some kind of belt on it. Ash looks up Poliwrath in his Pokédex. Tad says that his Poliwrath won a tournament back then. Knowing that it's a water type, Ash tells Pikachu to use Thundershock. Pikachu attacks, but Poliwrath evades it with Double Team. The many copies surrounds Pikachu. Pikachu goes through all of the copies with its Quick Attack. Pikachu shocks the real Poliwrath, but the attack didn't do much damage. Poliwrath uses Hypnosis, and Pikachu falls asleep. Lastly, Poliwrath uses Water Gun on Pikachu. Tracey says that Tad is very smart to let Pikachu use up its energy and then attacking. Misty thinks that Tad has lots of experience. Ash sends out Charizard for his second Pokémon. Misty and Tracey are worried about this, but Ash tells them to not worry. Charizard uses a Flamethrower attack on Ash. Tad tells Ash that he will never get into the Orange League if he uses Charizard. Charizard flies away from the battle scene, and it flies near the water. Poliwrath sprays Charizard with a Water Gun. Charizard, a bit angry, comes back. Ash tries to get Charizard's attention to battle, but Charizard justs knocks Ash down. Then Charizard tries a Flamethrower on Poliwrath, but the attack has no effect on Poliwrath. Charizard uses rapid fire attacks, but they don't work either. Ash tells Charizard to use a different attack, but Charizard doesn't listen to him. To wrap things up, Poliwrath uses Ice Beam freezing Charizard in a block of ice. Tad returns his Poliwrath and walks away. Team Rocket has been watching Ash's battle. Jessie is surprised that Ash lost the battle. Meowth knows that Ash and co. will be staying on the island because Charizard needs to be defrosted. Team Rocket starts to think of a plan. At night, Ash is busy keeping Charizard warm. He sees Charizard's flame running low, and so Ash continues to rub its back. Pikachu points to Ash's hands. He looks down to see that his hands are scorched. Ash tells Pikachu to take a rest, but Pikachu wants to help too. Together, they both try to keep Charizard warm. Charizard wakes up, and it begins to shuffle around. Ash tries to keep Charizard calmed. Then Charizard falls back to the ground. Misty and Tracey helps Ash keep Charizard warm. Tracey goes out to look for more firewood, and Misty gets the blanket from her backpack. Misty puts the blanket on Charizard. 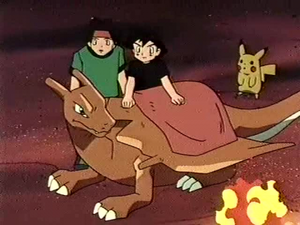 She tells Ash to use the blanket for rubbing Charizard. Tracey thinks that Charizard feels a little warmer, but its flame is still low. Charizard opens its eyes, but it is still weak. Ash explains to Charizard that even though he isn't the greatest trainer in the world, he knows that he is getting better. Furthermore, Ash wants to battle with Charizard as a team. Charizard remembers some of the good times he has had with Ash. A bunch of fires are now surrounding Charizard. Pikachu is glad that Charizard's flame is getting better. Everyone but Ash is starting to fall asleep. When everyone is sleeping, Ash continues to hope that Charizard will get better. The next day, Charizard is out looking at the sea. He shows Ash is flame as it has gone back to normal. Suddenly, something bursts out, causing Pikachu to fly into the air. The machine opens up, and Pikachu slides right into it. Tad runs up wondering what the commotion is about. Team Rocket starts to say their motto. Pikachu tries to shock the cage, but it doesn't work. Team Rocket escapes by going underground. Ash wants to stop them. Charizard offers Ash some help. While on Charizard, Ash follows Team Rocket. Charizard jumps onto the machine. Charizard is about to use Flamethrower, but Ash tells Charizard that using Flamethrower will burn up Pikachu. With a powerful stomp, Charizard breaks the drill instead. The cage falls into Charizard's mouth. The cage breaks, and Pikachu is safe. Meowth presses a button, and a saw comes out from the machine. Charizard barely dodges the saw, and Ash falls off the Pokémon. Charizard stares at Ash, and it gives a loud roar. The flame on Charizard's tail rises greatly. Charizard is getting ready to use Rage! A Flamethrower is shot out a Team Rocket. Their machine explodes, and Team Rocket blasts off again. Misty, Tracey, and Tad comes up to Ash. They congratulate Ash for getting Charizard on his side. Tad asks Ash for a rematch, and Ash and Charizard agrees on it. Tad sends out Poliwrath, and the battle starts. Poliwrath uses Water Gun, but Charizard flies into the air. Tad tells Ash that he isn't too bad. Charizard uses Ember, but Poliwrath's Water Gun douses it out. Poliwrath tries a Mega Kick, but Charizard's catches Poliwrath's foot. Poliwrath fires an Ice beam at Charizard, but Charizard dodges the attack. Charizard comes spinning down. It picks up Poliwrath and spins in the air. With the Seismic Toss, Charizard throws Poliwrath on the ground. Poliwrath is knocked out. Ash wins the battle. Tad congratulates Ash for his victory. They shake hands, and then Tad leaves the island. Ash now thinks that he can beat everyone with Charizard. Charizard shoots out one last Flamethrower at the group. Misty and Tracey tells Ash not to get Charizard mad.